Alright people, get ready for photo overload because this post got away from me a little bit – I just had so many great pictures from this race and I couldn’t decide which to not include! If you’ve been reading Live, Run, Grow for awhile first of all – THANK YOU! Second of all, you probably know that the Walt Disney World Marathon was my first marathon 3 years ago and I’ve done it each year since. That should give you a pretty good idea of just how much I LOVE this race – honestly, I look forward to it all year! 3:30am – Bus to Start Area! 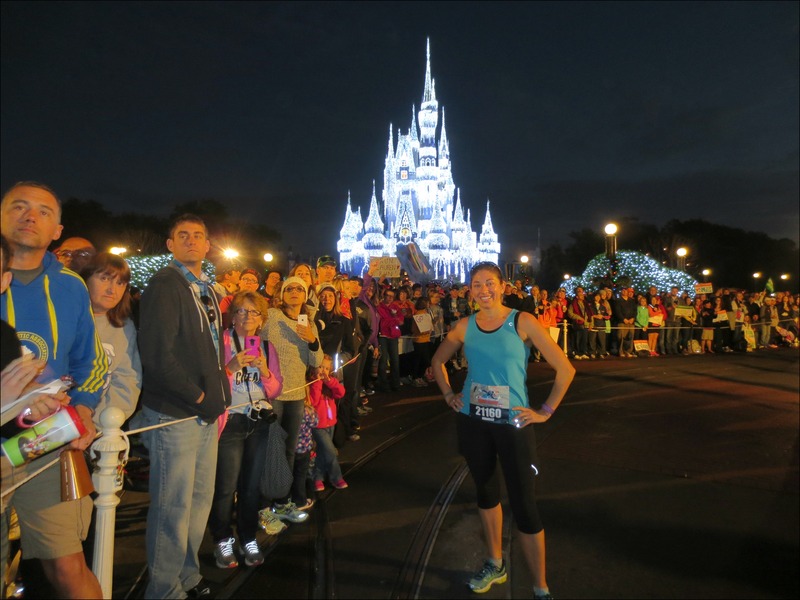 At around 5am we started the trek to the starting corrals (if you haven’t done a Walt Disney World Marathon Weekend half or full marathon it’s about a 20 minute walk!). 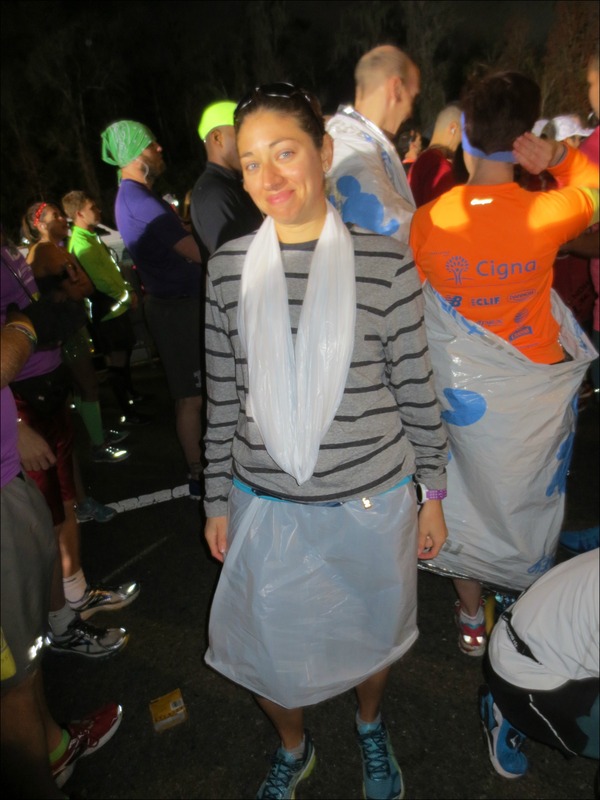 Fortunately I had brought a throw away shirt and snagged some trash bags from the hotel room to stay warm at the start – I really think I upped my pre race trash bag chic with the skirt and infinity scarf (does anyone else pride themselves on fashioning trash bags into pre-race outfits?? No, just me?). The good news was other than the chill in the air at the start, the weather was looking pretty good for the race! The first corral started and my trusty running partner in crime Daniel and I began to move up as each corral went off (I think there was about 3 minutes between corrals). When corral F was up we moved towards the starting line and I threw on the brakes. Well, I finally figured it out. Sneaky Daniel would hang back and cross the starting line just a few seconds after me so even though we’d cross the finish line at the same time he’d have a few seconds “in the bank” from his delayed start! Not this time my friend! I threw on the brakes right on the starting line and turned and looked at him. Pretty sure we spent a second or two trying to shove each other across the starting line first before we settled it like mature adults and crossed together – may the best man (or woman) win! Since I struggled with my fueling a little (or a lot…) during my last full marathon our plan was to walk through each of the water stops so I’d be reminded to take the time to fuel and hydrate. Walking through a water stop! Just past mile 5 we enter the Magic Kingdom and ran down Main Street towards the castle – no matter how many times I’ve done this it’s still amazing every time! As we entered Fantasyland we veered off to take advantage of the in-park bathrooms. Unfortunately there was a bit of a line in the women’s room so I text Daniel and told him I was going to keep going and to meet me at the Fronteirland bathrooms (quickly becoming my go to mid-race bathroom!). On the way I found the White Rabbit from Alice in Wonderland, Ulf the mime from Tangled and Louie from The Princess and the Frog! I re-joined Daniel and we headed out of the Magic Kingdom – but not before a close encounter with the Walt Disney Railroad train! …and then Donald and Goofy! We took a quick lap around the Walt Disney World Speedway and were on our way to Animal Kingdom! 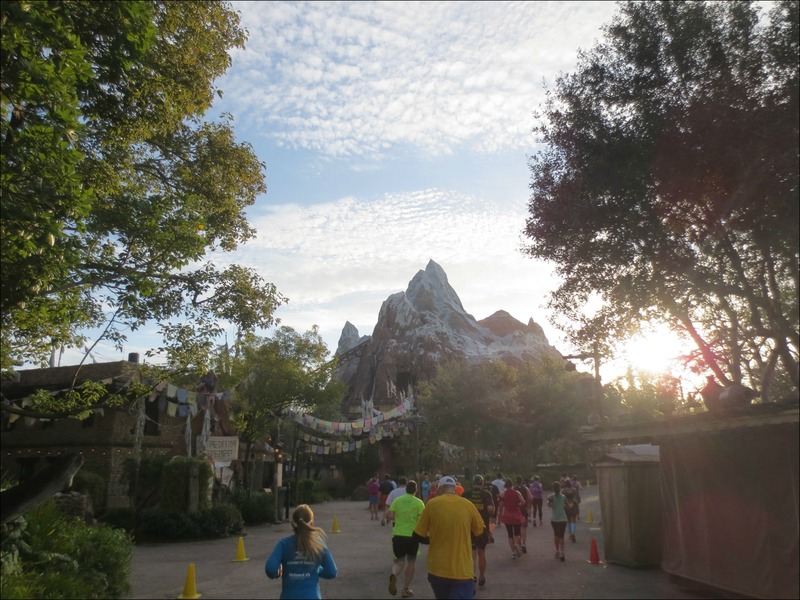 We ran through Animal Kingdom just as the sun was rising over Everest! And right outside Animal Kingdom (and just past the halfway point if I remember correctly!) we found my husband Jason and our friend Jenn! 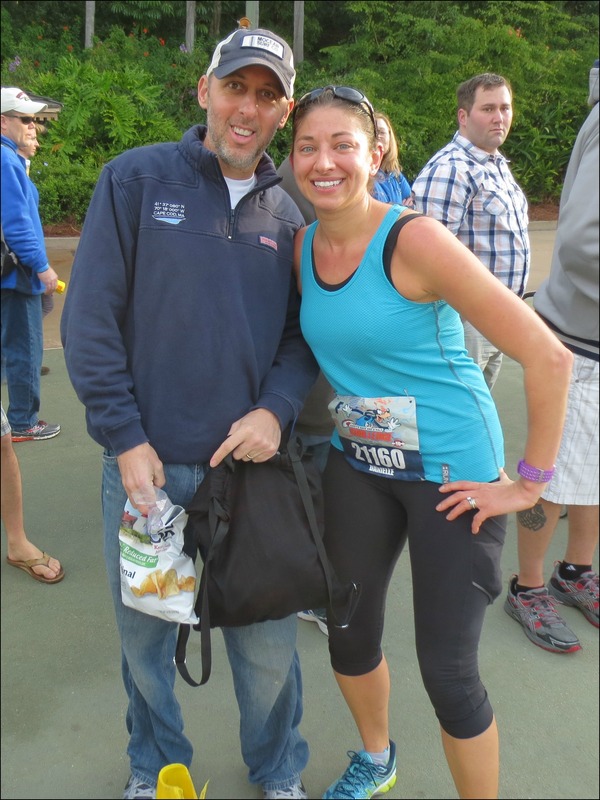 Jason had fuel for me – Cape Cod potato chips! – and we took a few quick pictures and Daniel and I were back on our way! But not before a quick photo stop with the mouse that started it all! …clearly Daniel and I had two very different creative visions for this photo…and honestly I think his wins. 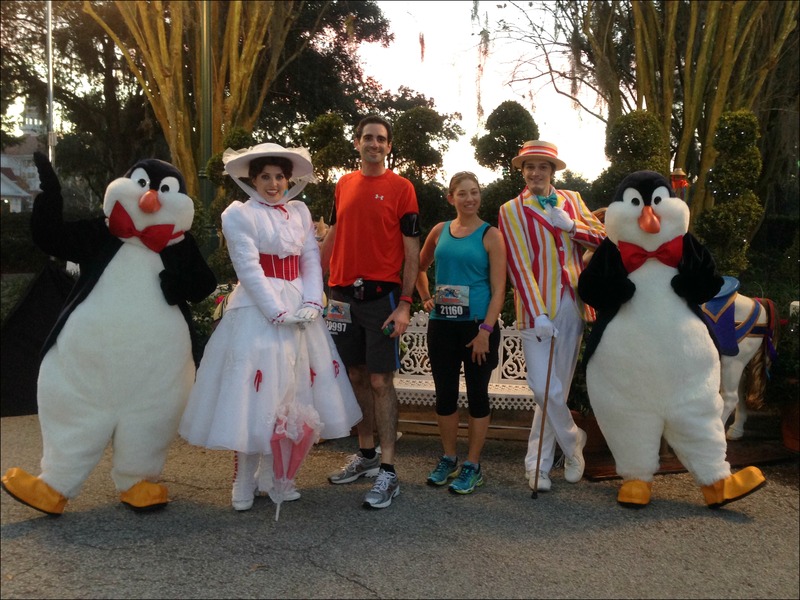 At this point I’d like to give runDisney a virtual high five for adding some new characters to the course for this race! I’ve mentioned in other runDisney race recaps that they tend to put the same characters in the same place year after year, and there were a lot of repeats this year, but overall I think there was a good number of different characters out for the full this year – like Chip & Dale in their referee uniforms! 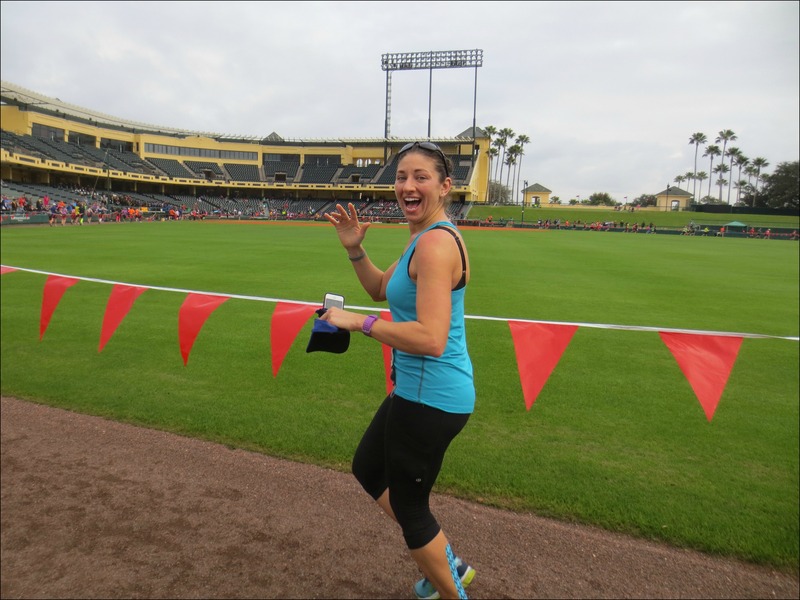 We weaved around the Wide World of Sports for 3 miles – we ran around the track, through the fields and ran the bases in the stadium before heading out just past the mile 20 marker! 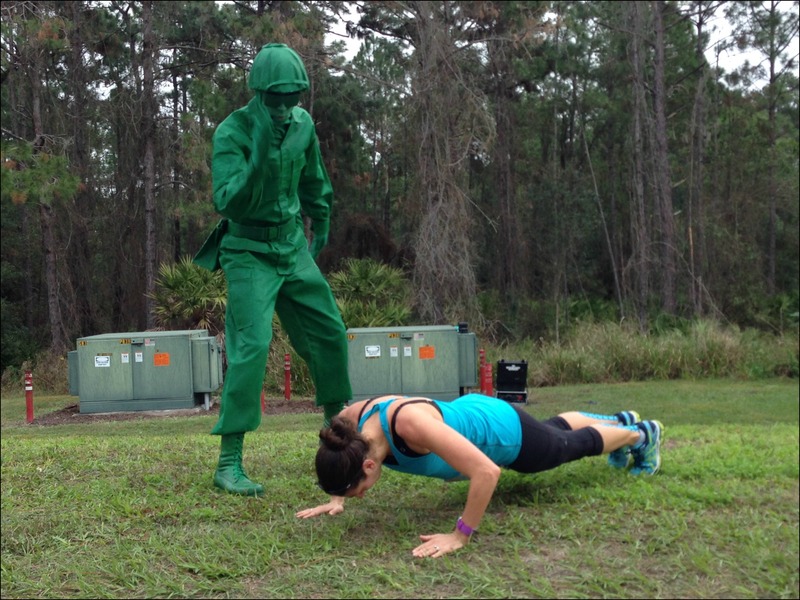 A hill at mile 21 and you know what that means – PUSH UPS WITH THE GREEN ARMY MAN! We’d been fairly lucky as far as weather goes so far, it wasn’t too hot (at least compared to past years! ), and there had been a nice cloud cover so it wasn’t too bright. But, with clouds comes rain and as we entered Hollywood Studios it began to sprinkle a little. It was funny because when Daniel and I entered the dreaded costume tunnel (dreaded for me because they fill it with strobe lights which trigger my migraines, I literally walk this part with my eyes pretty much closed – *runDisney PLEASE get rid of the strobe lights!!) it was just misting, but when we came out the other end it was full on raining! I have to admit the rain actually felt really good! Ok, so not so much a character stop as Daniel’s family! Daniel’s girlfriend Tana re-fueled us with more potato chips and some orange juice (yup, I LOVE orange juice mid-race…I know, weird.) and we were on our way to Epcot! 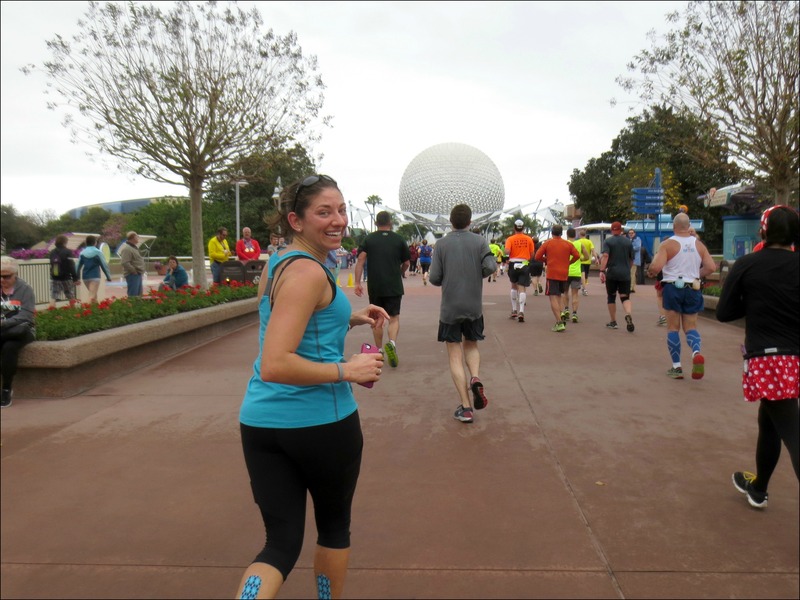 Surprisingly at mile 23 my legs were feeling great and I was cruising towards the Boardwalk area, past the Yacht & Beach Club and entered Epcot at mile 25 ready for that victory lap around the World Showcase! Just past my epic high five we saw Jason and Jenn again! We only stopped for a quick hello – we had a finish line to get to! 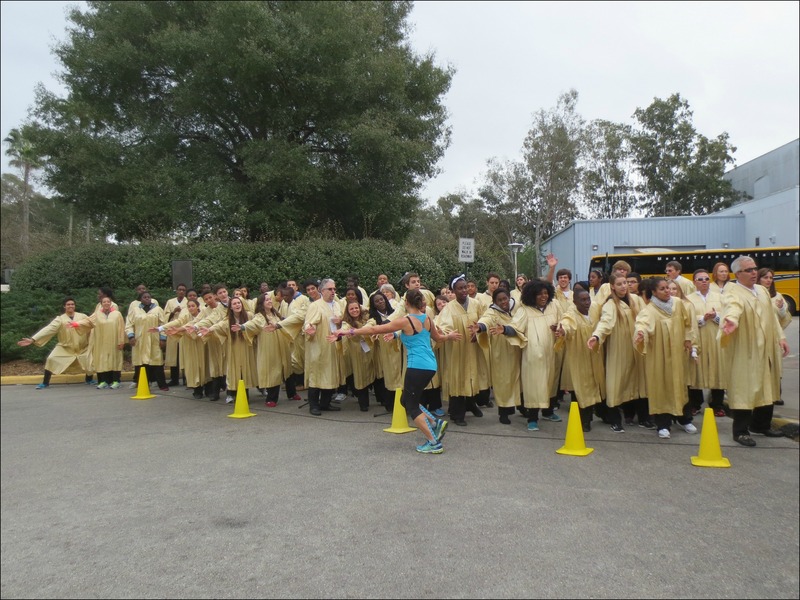 Oh wait…one more epic high five – with the ENTIRE mile 26 choir! Followed by an epic finish line selfie! So remember that friendly competition I mentioned earlier? 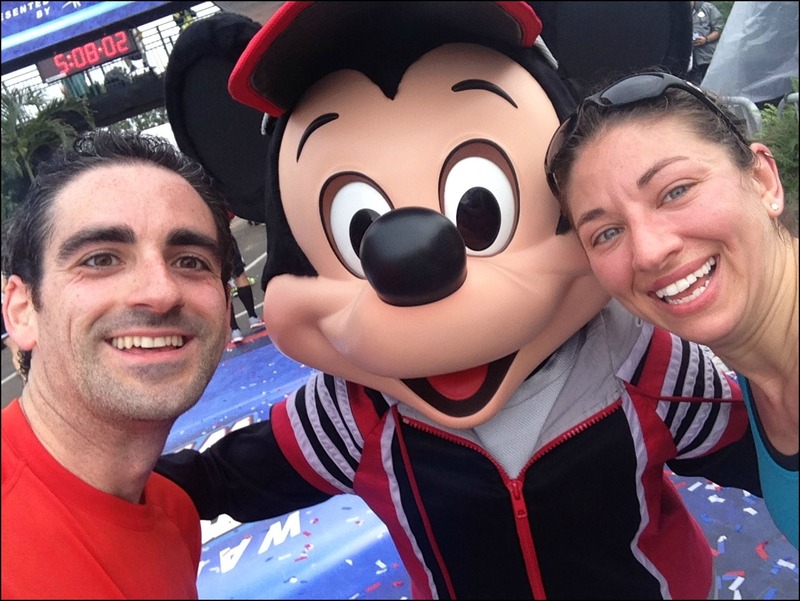 Well mid-selfie with Mickey I realized Dan was just a little closer to the finish line than I was…SO I MADE A BREAK FOR IT! 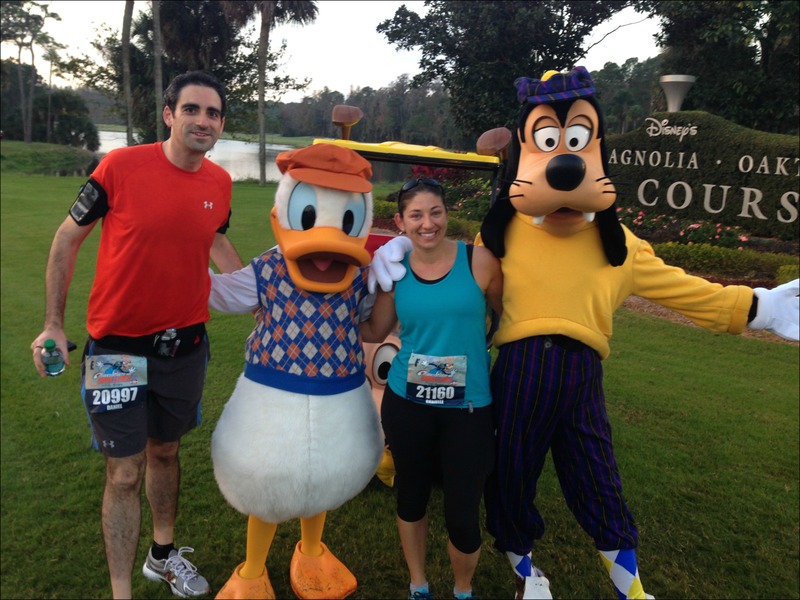 And with that, the 2015 Goofy Challenge was complete! Is there a race you love so much you do it over and over?? 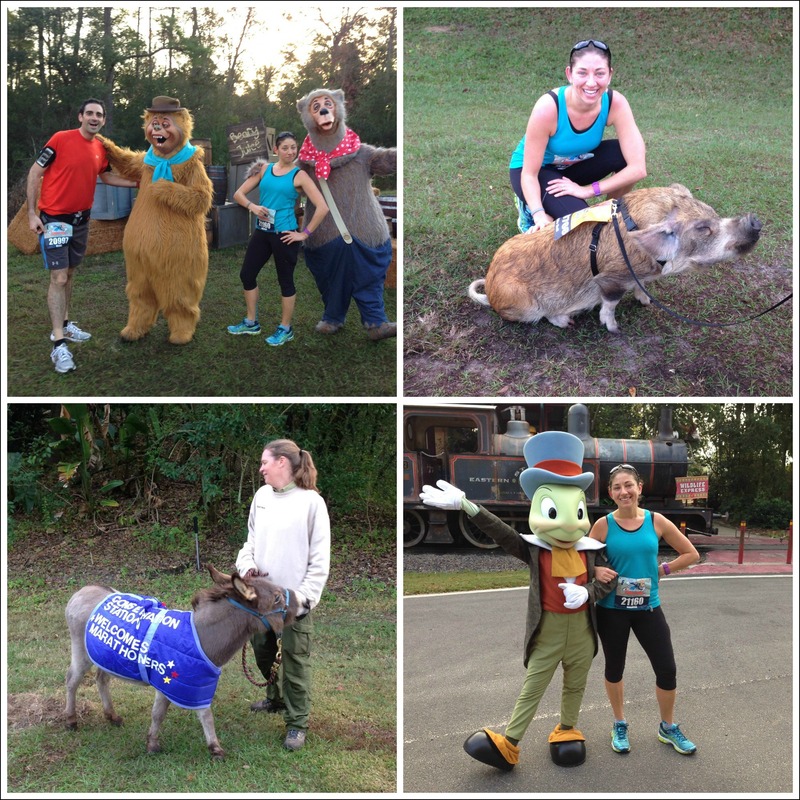 What character would you love to see at a runDisney race? 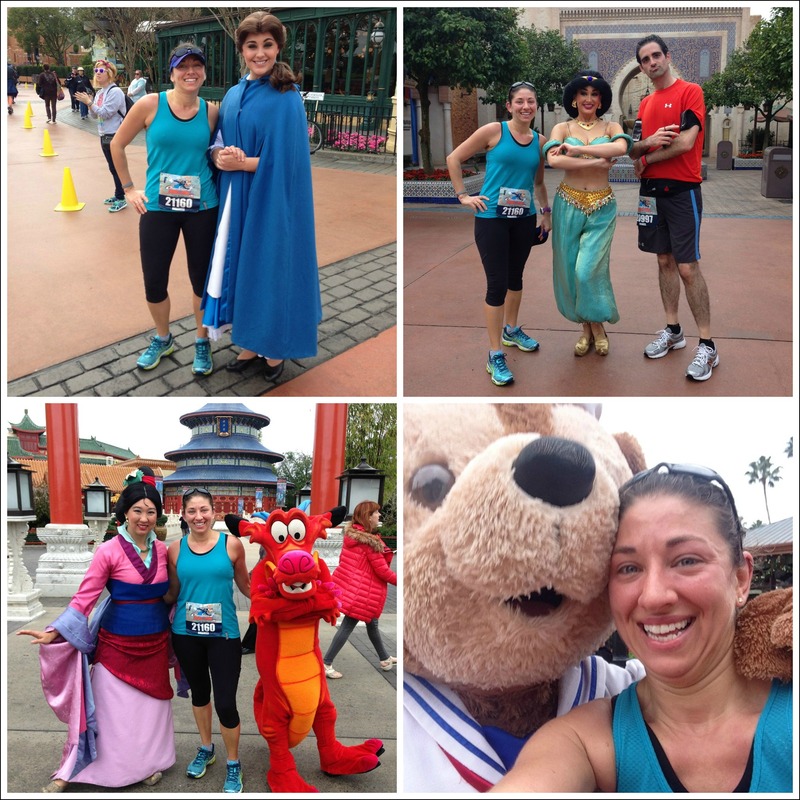 Great recap Danielle, it was fun seeing your pictures of all the characters out there! I didn’t stop for character pics and I honestly forgot about a few of them. I was thinking about you getting down for push ups when I ran past the Green Army Man 🙂 The strobe lights didn’t bother me as much as the smoke in the tunnel…I was choking on that stuff after 23 hard miles! And so cool that Jason ran the half with you too, good for him! Glad to see I’m not the only one late in getting a recap out…mine goes up tomorrow. There was just so much to write about! Ugh, yes, I wish they would just get rid of everything in that costume tunnel and just put some regular lighting! Great recap! I especially liked all the pictures. I’m in one of them, sorta. I was spectating at the end of Main Street. In you castle picture, on the castle side of your head, your ear touches my glasses. LOL. Congrats on evening the score with Daniel! 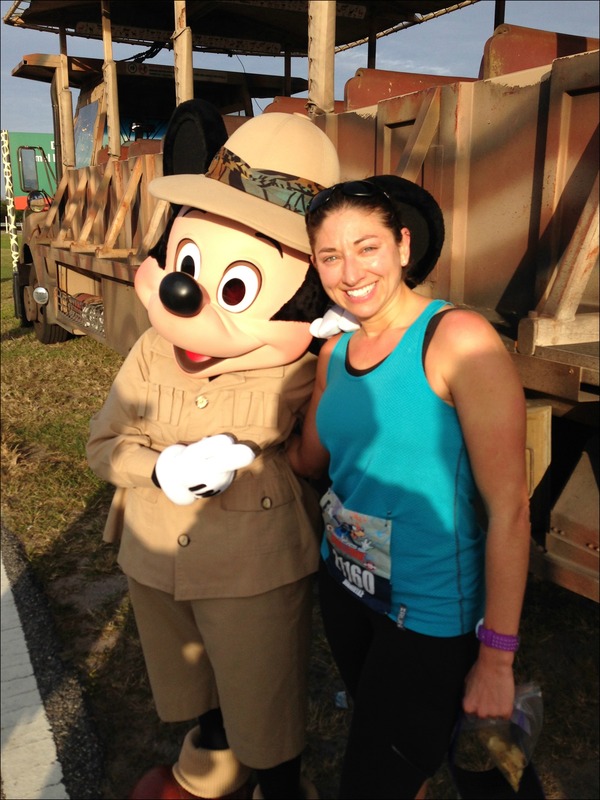 And Major Congrats on a Goofy Challenge well run – Awesome!! Oh my gosh, that is too funny that you’re in the background of one of my pictures! 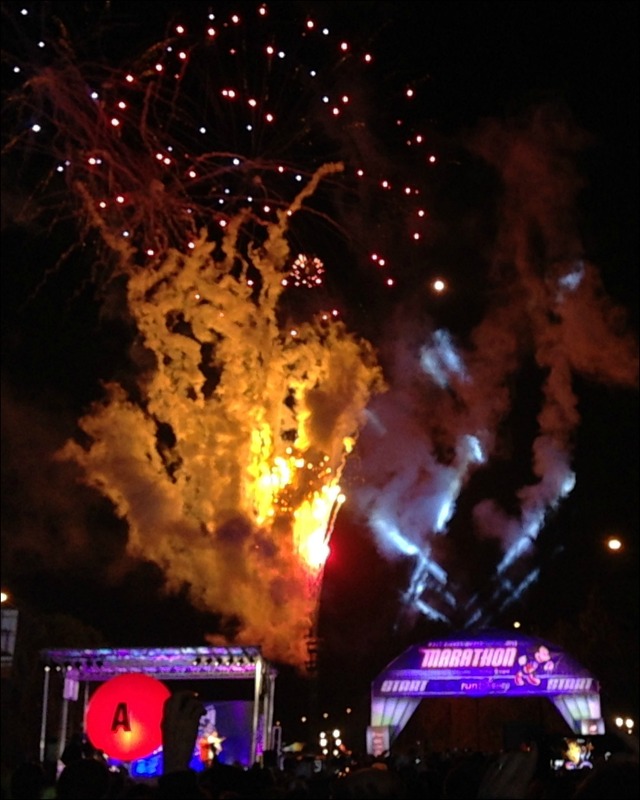 I hope you had a good time spectating – what a great location to watch all the runners go by! Very nice recap Danielle. 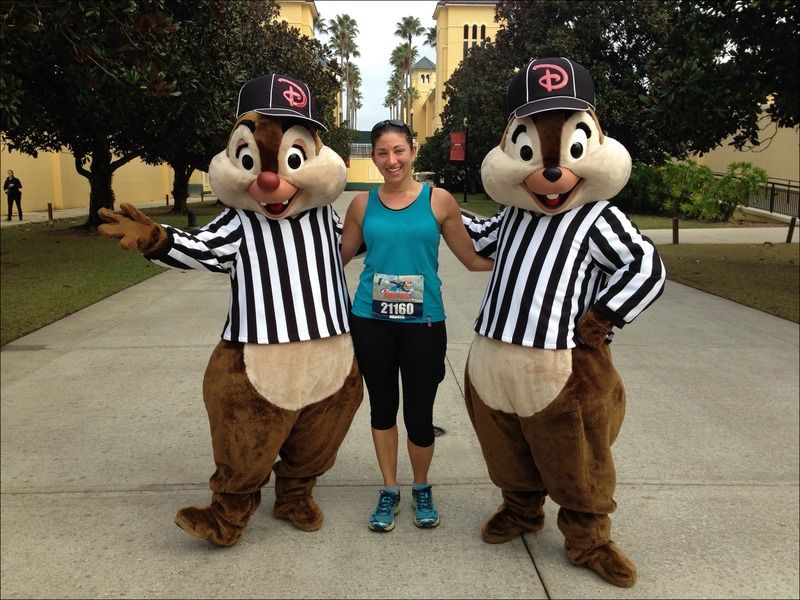 I love all your photos and the Chip and Dale character stop is great….love them in the referee uniforms. I hope they keep that for future years. 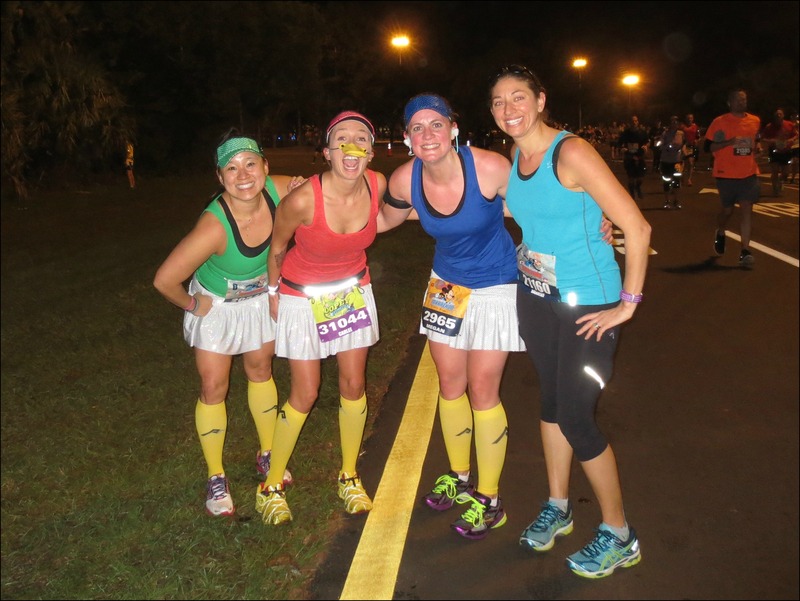 We definitely want to go back for marathon weekend next January! Yay – I hope to go back next year too, I just love this race! I could’ve used those potato chips during the half last year. I think they’re my favorite potato chips ever. Oh my goodness, me too! I get the reduced fat kind too and they are great! Great recap! I took a ton of pictures too. Maybe I’ll run into you next time, like last year. Thanks for sharing! Sorry we didn’t “run” into each other this year again! Hope to see you soon! Great post. You should write for a runners mag your that good. I think I can speak for everyone in saying a your reviews and comments are REALY good. Great race! AHHHHH loved it all! Great recap, my friend!!!!!!!!! Haha, thanks Krissy – so glad I got to see you guys quickly! Great job Danielle! I am so hooked now that I have done Dopey! I HAVE to do it every year from now on! Haha, I think I’ll probably be sticking to Goofy – those 4 early mornings were a bit much for me last year! Glad you had a good time though! Very cool- looks like so much fun! Congrats! AAAHHHH I love this!!! Now I want to do it again more than ever! Glad you had a fantastic race. And nice work outsmarting that crafty Daniel! Haha, why thank you Becca! Looks like you had a blast! Congratulations! Haha, I can’t honestly still can’t believe that I have that much fun running 26.2 miles! Great recap! 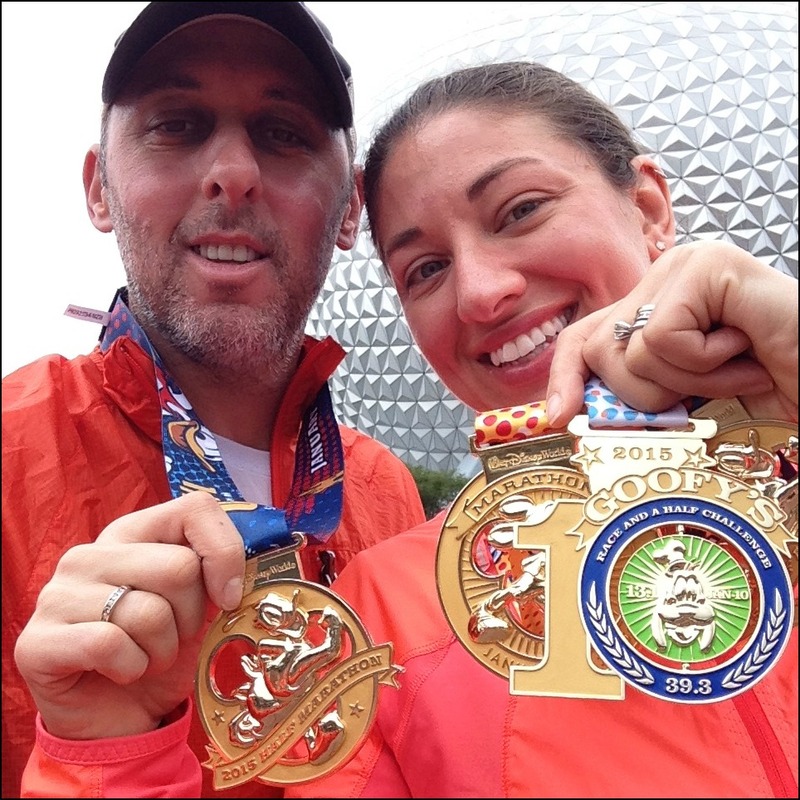 Since o just finished Star Wars and have officially run all of the rundisney races half distance or more, I can confidently say that the WDW Marathon is my favorite course hands down! And the characters are great. My biggest pet peeve for this year was the first 7 miles or so we’re the exact same characters for the half and full which was a bit of a letdown. Oh I am so jealous that you’ve run that many! Out of the races I’ve done, the full marathon is by far my favorite! AWESOME recap! 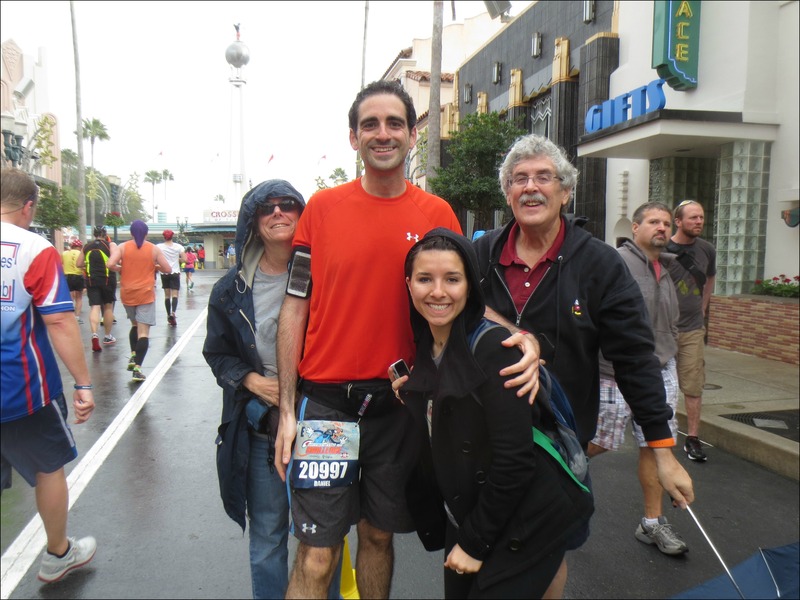 I love it when I find someone who enjoys Disney races as much as I do, haha. 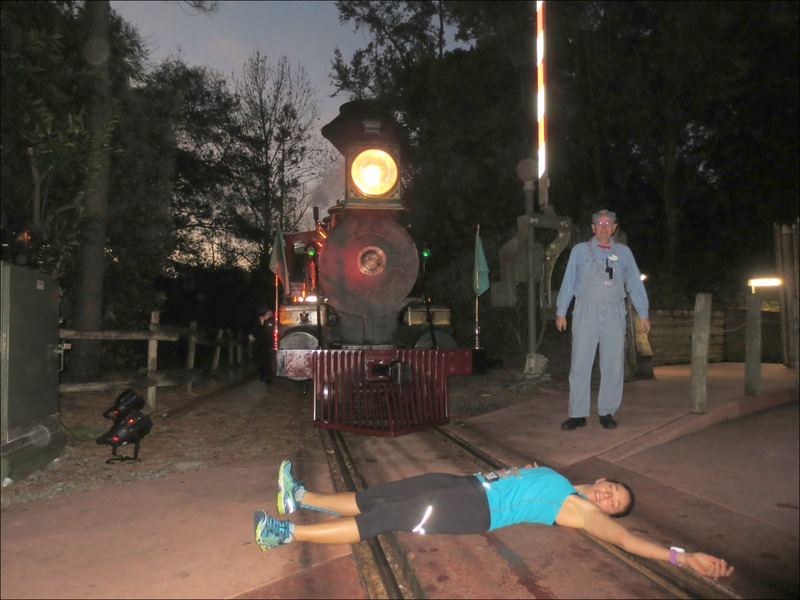 There is NOTHING like the WDW Marathon — if I could run it every year for the rest of my life, I totally would. 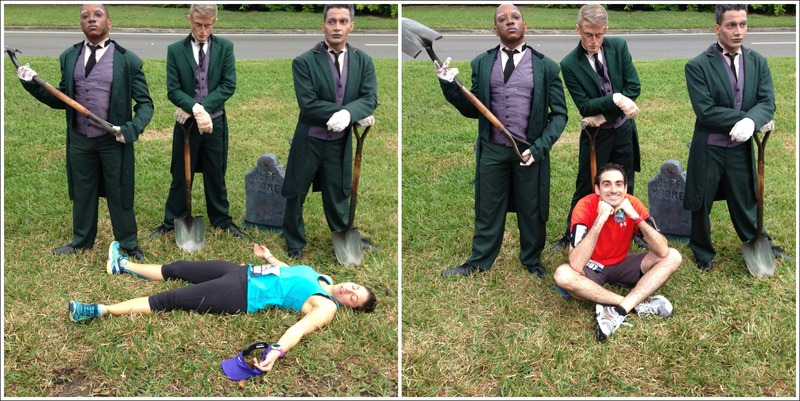 Looks like you guys had a blast, and your finish line picture is hilarious! Thanks Jennifer! I really had such a great time and really hope to do this race as much as I can! Can’t wait to read your recap! I LOVE LOVE LOVE LOVE LOVE ALL THESE PICTURES! I need to get to a faster corral so I don’t have to wait on insane lines for them! 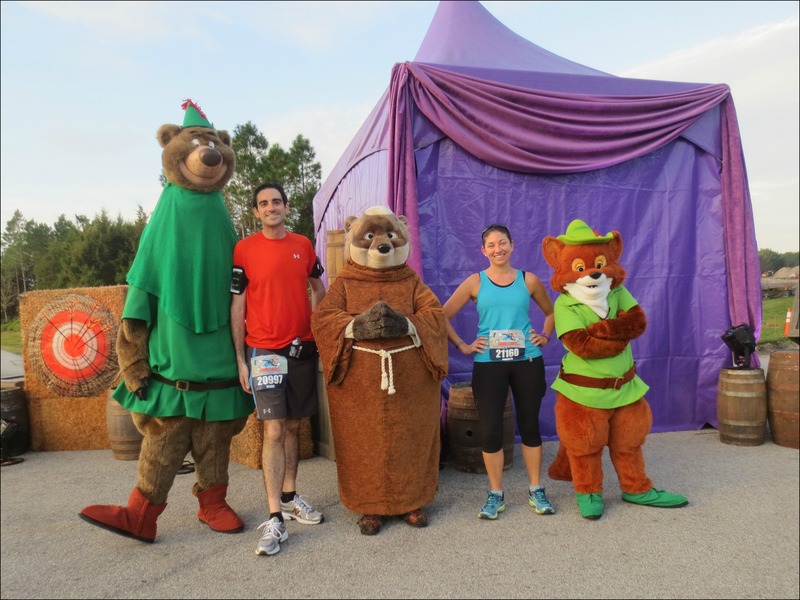 You look like you had such a blast and make me (almost) want to do this again…eventually (Dopey 2018! I love me some anniversary bling). Thanks again so much for being my cheering squad and “fuel” stop in Germany! You’re awesome! 2018?!? That is SO far away! Haha, yes, I do have a blast during this race every year, I just love it! I am so glad I got to see you run by (and give you your beer!) in Germany! 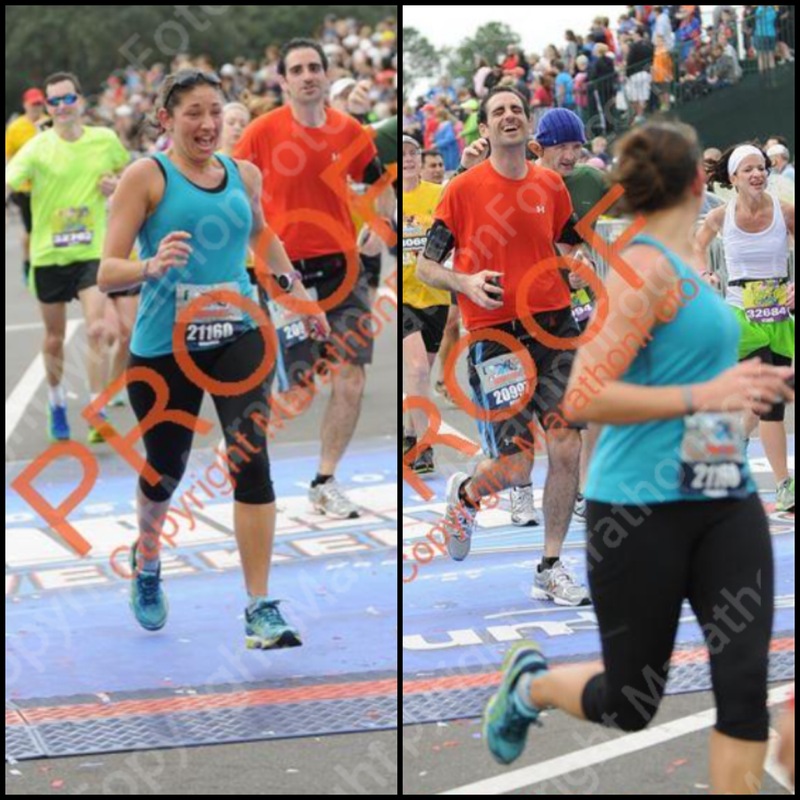 I love that I’ll forever be the person that handed you the beer to cross the finish line with for your first marathon! Danielle, I love this post and ALL the pictures!! The one of you crossing the finish before Dan is PRICELESS!!! And I love the one of you with the volunteer too. 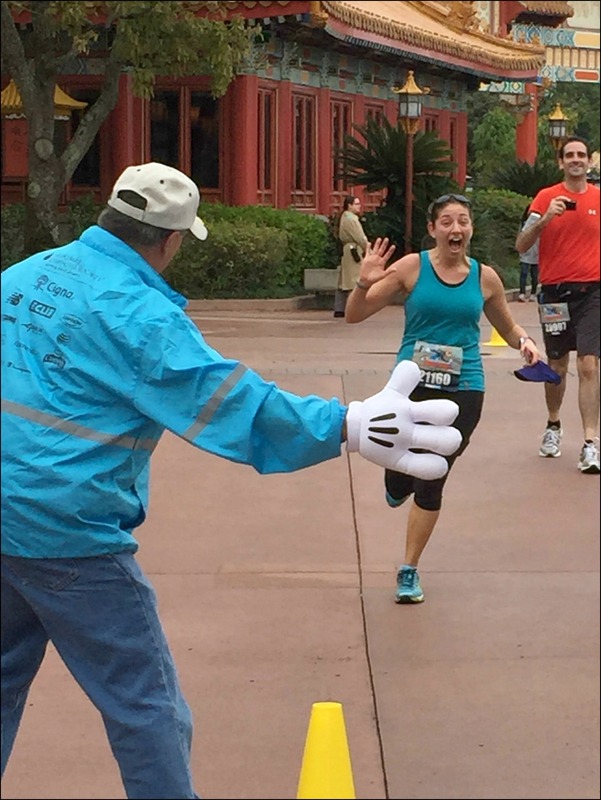 The look of sheer joy on your face makes me want to do the WDW marathon one day too!! Congrats on such well-earned bling!! Thank you so much Shannon! I love those pictures too for exactly the reason you said, I really do feel like they show just how much fun I was having! Great recap! 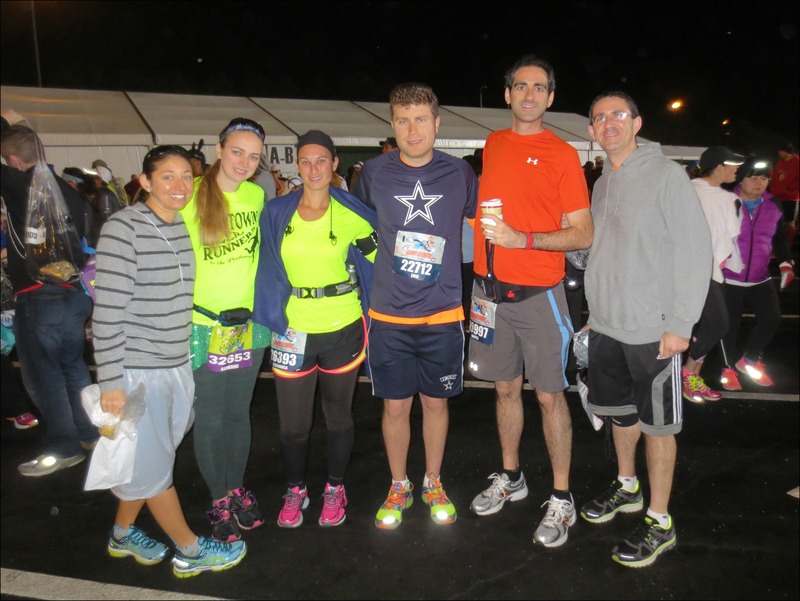 I absolutely loved the marathon course and am already considering running it again next year. I kept your “chunking” post in my head throughout the race. 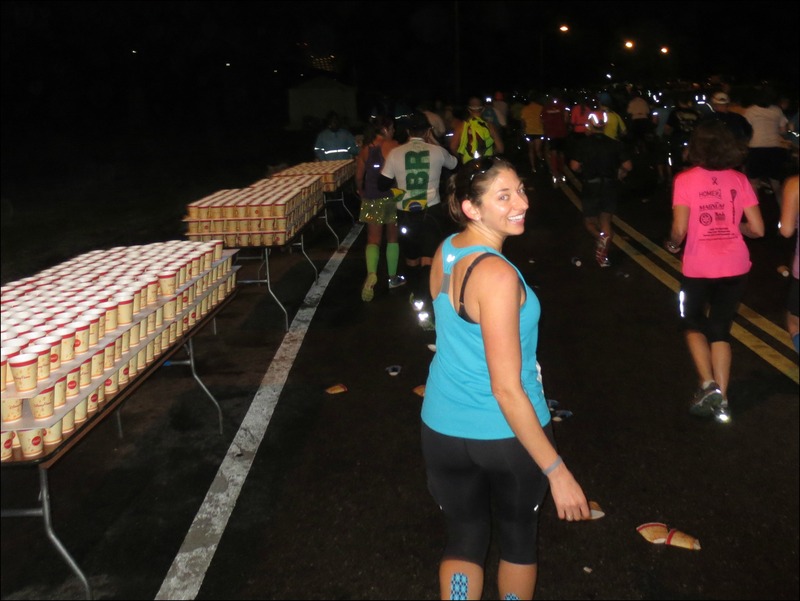 Were you at the Poly the night of the marathon? I thought I saw you, but didn’t want to say Hi to the wrong person haha! Oh my goodness, YES! Jason and I had dinner at Kona on Sunday after the marathon! I’m so sad we didn’t get to meet, but I totally understand…it’s sort of weird when you THINK it’s someone you recognize, but you’re not totally sure. Oh well, hopefully next time! Congrats! You got so many great character pictures!! I’d love to see Robin Hood! I JUST rewatched it with my niece. I also love the Jimmy Cricket pic! And of course, the farm animals 🙂 I’ve never seen Flounder and Sebastian on course. That would make me pretty happy. Ooooh, Flouder & Sebastian would be good ones! There are so many great characters to choose – that why I hate that they repeat them so often!